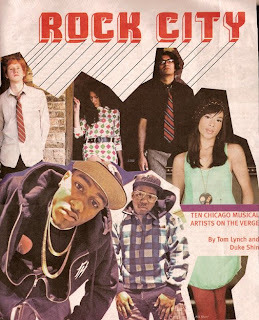 Check out this recent article in Newcity Chicago Magazine, which covers 10 up-and-coming Chicago music artists you should know about. Included in the feature are one of my personal favorites, STAR, as well as Airiel, Brighton, MA, Cool Kids, Flosstradamus, Kid Sister, Mannequin Men, Santiago & Bushido, Scotland Yard Gospel Choir and Ultra Sonic Edukators. I'm not sure I agree with some of the people on that list, especially because Flosstradamus has been on the rise for a couple years now. great list overall. looove STAR!